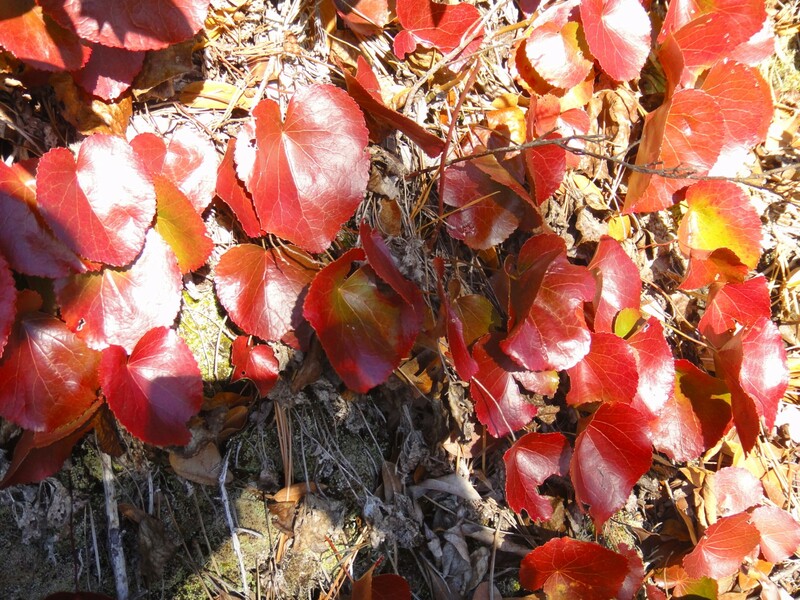 Posted by Jenny in hiking, Southern Appalachians, White Mountains. 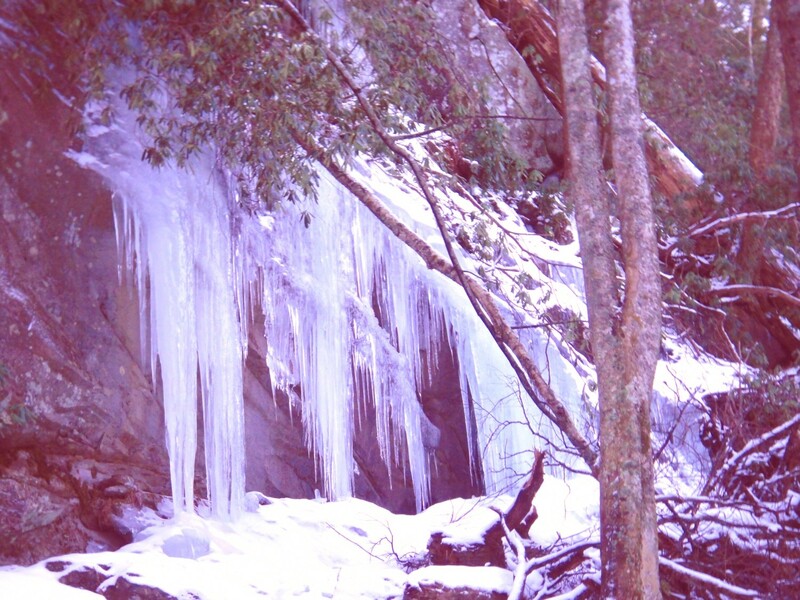 Ever since I moved back to the Southern Appalachians, I’ve heard hikers comment along the lines of, “We decided not to do that hike because conditions were too icy.” That seems a shame when so many tools are available for dealing with ice or with steep, slippery snow. People around here are starting to catch on to devices like Kahtoola Microspikes. They’re great for many winter conditions—if you had to pick just one device, I’d recommend these—but they aren’t perfect for every situation. 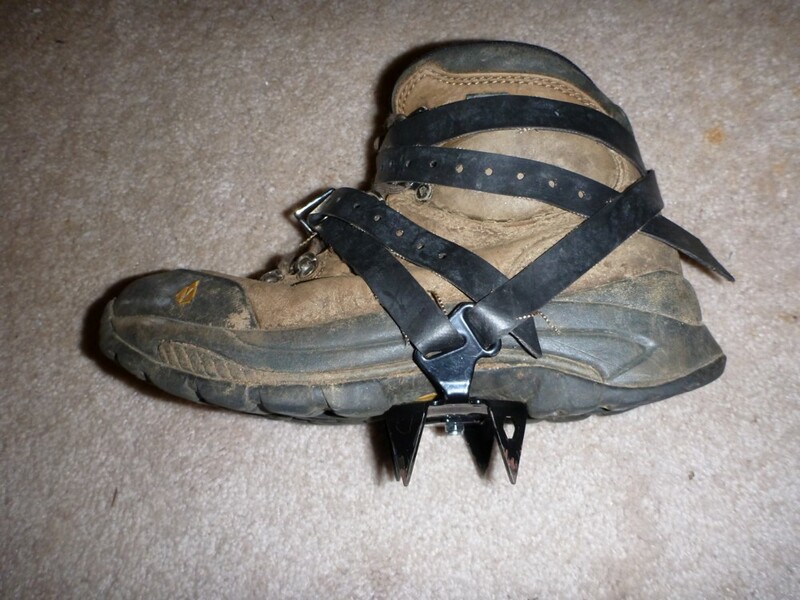 Up in New England, where I did winter hiking for 16 years, microspikes have become so popular that people sometimes make the mistake of using them in situations, like steep hard ice, where crampons are needed. I remember hearing about a group doing a winter traverse of the Presies (i.e. Presidential Range) who nearly had a fatal accident. One of them was climbing up the icy slope of Mt. Jefferson with microspikes and took a long, frightening slide. 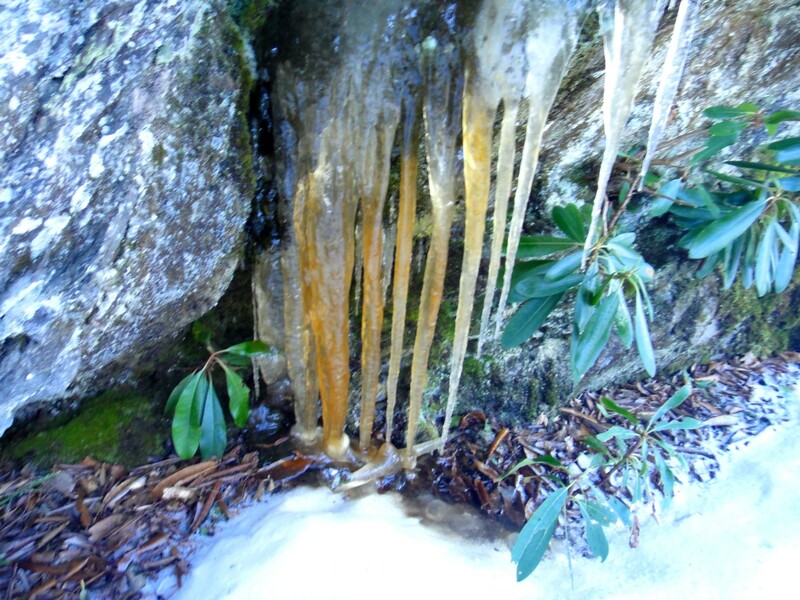 For many years in these parts, people have used instep crampons on icy trails like the Alum Cave Trail on Mt. LeConte. They’re certainly better than bare bootsoles, but they have serious limitations. They only give you four points of traction, and they’re quite awkward when you get past the icy stretch and walk on bare ground, especially rock. So you end up taking them off and putting them back on at regular intervals. Another option is Yaktrax. I gave away my pair and can’t offer my own photo, but here is one from Wikimedia. Definitely an improvement over the insteps—easier to put on and take off, more effective—but personally I have been more satisfied with the microspikes. 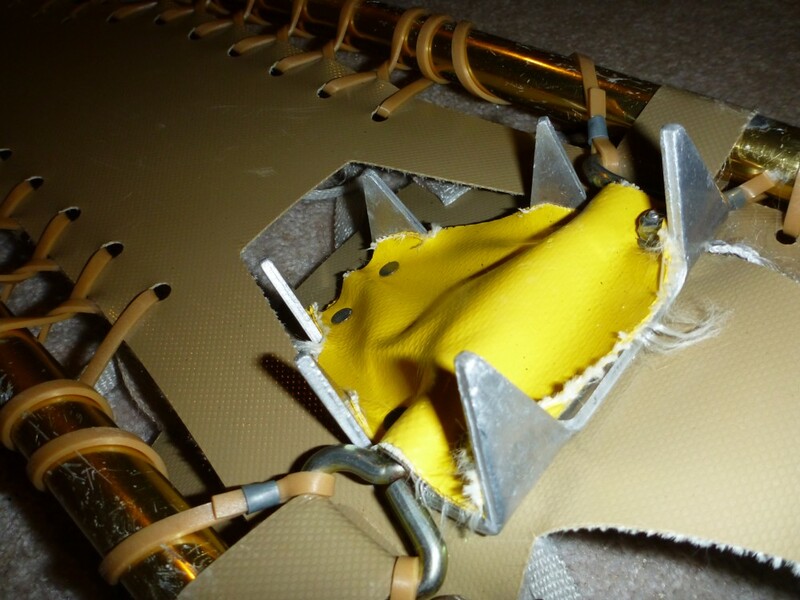 Here is what the microspikes look like before you pull them on. They can easily fit in a large zip-loc bag. The red connector bands are flexible enough that you can use them on a variety of boot types. Here they are on a pair of Sorel boots. Now, for a digression into boots. I find that regular hiking boots are fine for temperatures down to 20 degrees or so—below that, I start having trouble with icy feet. Obviously, each person reaches that discomfort level at a different temperature. Colder than that, you need boots like Sorels with felt liners or plastic mountaineering boots. I should say that I differ from most people in preferring Sorels to the plastics. If you go to an outdoor equipment store, chances are they’ll tell you the Sorels are only good for shoveling snow out of the driveway. But I found them to be very comfortable and very warm, and I’ll just say that I climbed all 48 of the 4000 footers of New Hampshire in winter wearing Sorels. I even went up the Lions Head route on Mt. Washington in Sorels. 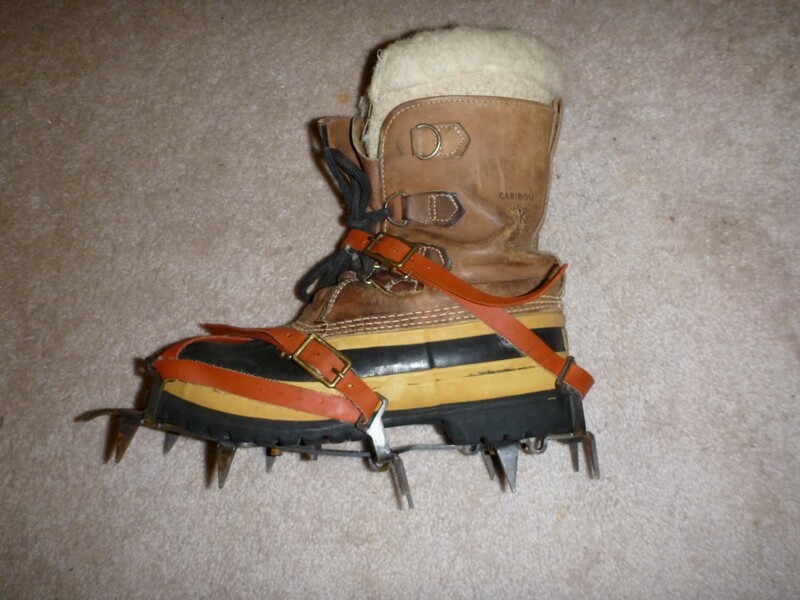 As you saw in the above photo, microspikes fit just fine on the Sorels. So do strap-on 12-point crampons. The one disadvantage is that you can’t use step-in crampons with Sorels, and the strap-ons take more time to put on and take off. You see the plastic boots with step-in Grivel 12-point crampons in the photo at top. The step-ins are very convenient—the part behind the heel snaps into place, and then you just have one strap to deal with. My problem with the plastic boots was that I felt like I was wearing cinder blocks on my feet. By contrast, the Sorels were so comfortable that I always felt reluctant to switch back to my regular boots in spring! Neither the strap-ons nor the step-ins depicted above are suitable for technical ice climbing. That’s a whole other deal. You use two short ice axes, one in each hand, instead of the long mountaineering axe. You see that I’ve wound some medical tape around it for better grip, plus I’ve attached a leash. Probably most of the time in the Southern Appalachians you’d do just as fine with a trekking pole. 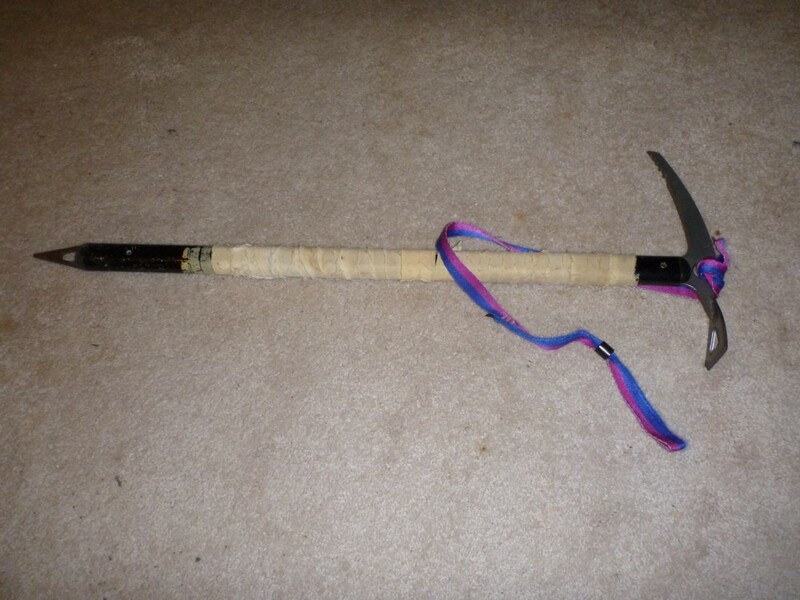 The ice axe does work better for steep icy conditions. Ice axes can be surprisingly versatile—my friend Greg Harrell did some “thinking outside the box” and came up with a technique for using an axe while doing steep climbs up slides in the Smokies, regardless of season. Finally, a word about my personal experience with snowshoes. 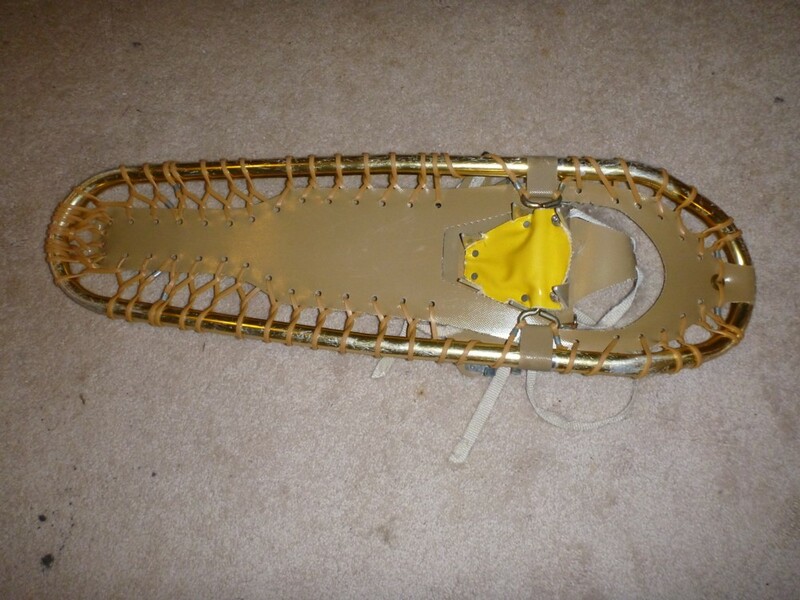 In 1993 I purchased a set of 36″ Sherpa snowshoes and had the optional big claws put on. With these snowshoes, I was able to march right up steep snowy slopes without backsliding, while my friends with smaller claws struggled along. Well, I can’t recommend the Sherpas, for the simple reason that the company went out of business a while back. 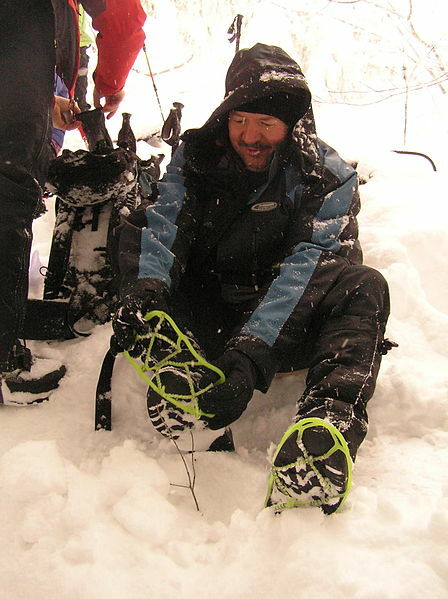 Much smaller, lighter snowshoes have been the trend for a while. But I wonder how people do with those in really deep, unconsolidated snow. It comes down to the simple physics of “flotation”—you need a good-sized surface area to keep you from sinking down. By the way, forget about those advertising images you see, like in L.L. Bean catalogs, of people gaily scampering along in their snowshoes. Look closely, and you’ll see they’re on a surface that’s already packed down! Real snowshoeing isn’t about trotting around on a touring center track, it’s about getting to places in the mountains that you couldn’t reach otherwise. 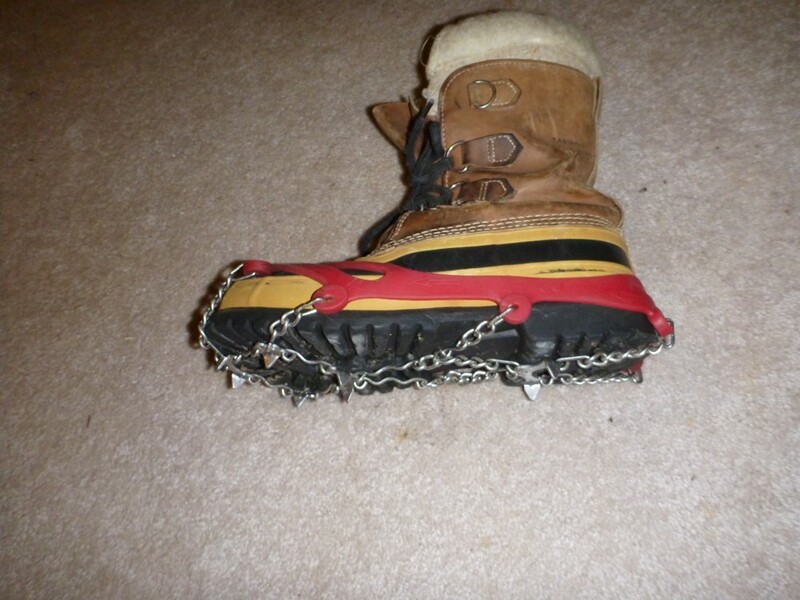 Good luck with your winter hiking. Every now and then I have a hiking experience that leaves me divided as to whether it was worthwhile or not. The last time I had this sort of outing was on my unsuccessful attempt to go up the Ravine of Raymond Cataract. This time, on a beautiful spring day, I decided to do a hike I’d done before, going up Woody Ridge to Celo Knob in the Black Mountains. It was partly just to get some good exercise, since the trail is very steep, ascending 3200 vertical feet in 2.2 miles—about a thousand vertical in one particular short steep section of well under half a mile. As soon as I got onto I-26 heading north of town, I saw that all the high elevations in sight had snow on them—visible mainly on grassy spaces and ledges, but definitely lurking everywhere under the trees. Of course! The big rain event we had in town on Wednesday had been a snow event in those places. This is the sort of thing that I really should have thought about ahead of time—the kind of thing I’ve been known to sneeringly criticize others for not realizing—but now the joke was on me. 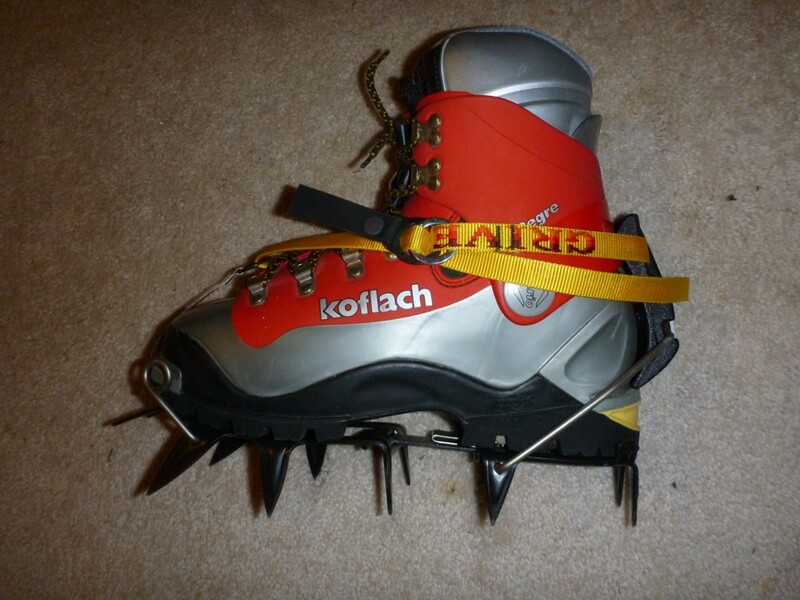 I had plenty of warm clothing with me, but the one item I should have brought with me was my microspikes or any sort of traction device for going up steep snowy terrain. Should I turn back and get the spikes? I thought about it, but you know, it is very hard to turn around once you’re moving along on the open highway. I turned east to Burnsville, then south on Hwy. 80 at Micaville. The Black Mountains towered above the Toe River valley—the upper gullies and ridges looking quite snowy. I drove to the Woody Ridge trailhead at 3200 feet and started my way up. Temperatures were pleasant, the trail was mostly bare with a few patches of snow. I reached the start of the steep section, which is a very distinct departure from the gentle woodland climb below. Up, up, up over bare ground splotched intermittently with white. At around 4500 feet, I got into continuous snow. Slippery—but at least I had my poles. I slithered and scrambled up the trail, my boots doing a sort of comical Road Runner routine of spinning around in circles with minimal forward progress. 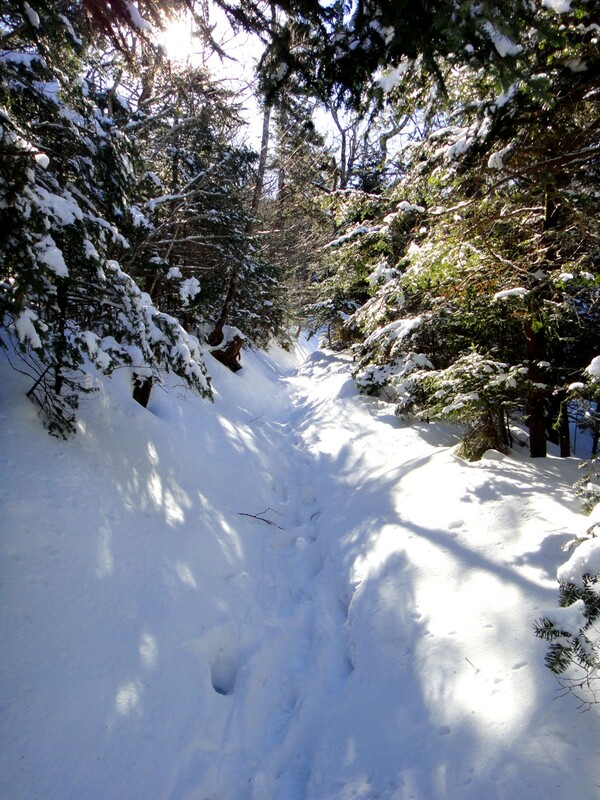 At around 5000′ I looked at more steep snowy trail above me. The will to continue dissolved. (In fact, if I had continued another few hundred vertical feet, it would have gotten less steep and probably better.) I was there by myself and no one in the world knew where I was. I fall somewhere in the middle between folks who won’t go anywhere on their own without someone else knowing their destination, and others who will do all sorts of crazy things on their own and take the risk (you know who you are!). It wasn’t the physical effort that was the problem, it was the continuous slipping that made me wonder when I would collapse in some interesting and awkward position with appropriate injury to ankle or knee. So I turned around, and going down was a lot harder than going up. I retreated very slowly with my tail between my legs. When I think back on it, part of me feels embarrassed not to have forged ahead. Part of me looks back on the image of myself climbing alone in the snow without proper gear, and I have this odd feeling of pride for being out there at all. There is a certain kind of intensity to the memory that I actually treasure, the solitary struggle up the trail. What do you think? Be honest—I’m not looking for validation. You can tell me you think I should have gone to the top. The temperatures in the valleys were supposed to get up into the 50s with sparkling sunshine. 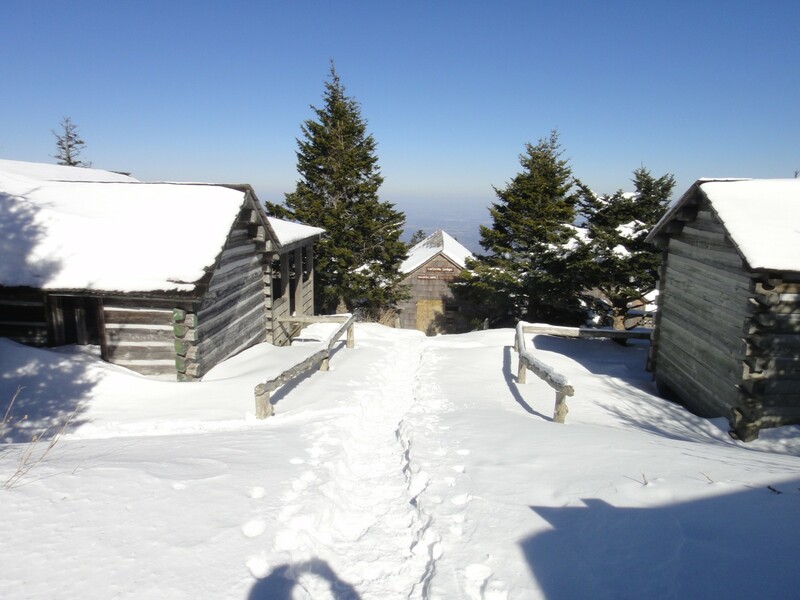 The top of LeConte had 22″ of snow following a fresh storm two days before. What does this add up to? A decision to do a hike with a large amount of elevation change so that I could see all the different conditions—a winter/spring sampler! I started at 8:00, and apparently that was the time that everyone doing the Rainbow Falls/Bullhead loop had decided to start. A pair of college-age guys set off just as I pulled into the parking lot—a woman arrived in a silver pickup, jumped out, and headed up the trail—and then a guy swished into the lot in a late-model BMW sports coupe just as I was starting up. Sports coupe guy passed me when I stopped to put on my microspikes, and I never saw him again—I passed the two guys, who had heavy gear—I passed the woman, but we crossed paths again when I was coming down from the summit, and we had some pleasant conversation. I was pleased to see another woman doing a challenging hike solo. It’s amazing how rare that is. I found myself wondering about the patterns of hiker traffic on LeConte yesterday. Clearly, the hikers just going to the falls didn’t need to start until much later. When I got back down at 3:00, the parking lot was jammed. But the weird thing was, I only saw three people on the summit, and I think one of them was the caretaker. I’d expected hordes to be coming up Alum Cave. Where were they? Did icy conditions on the trail turn people back? I ran into a couple coming up the Bullhead trail. So, total of nine other humans seen on this very popular mountain on a beautiful Saturday. 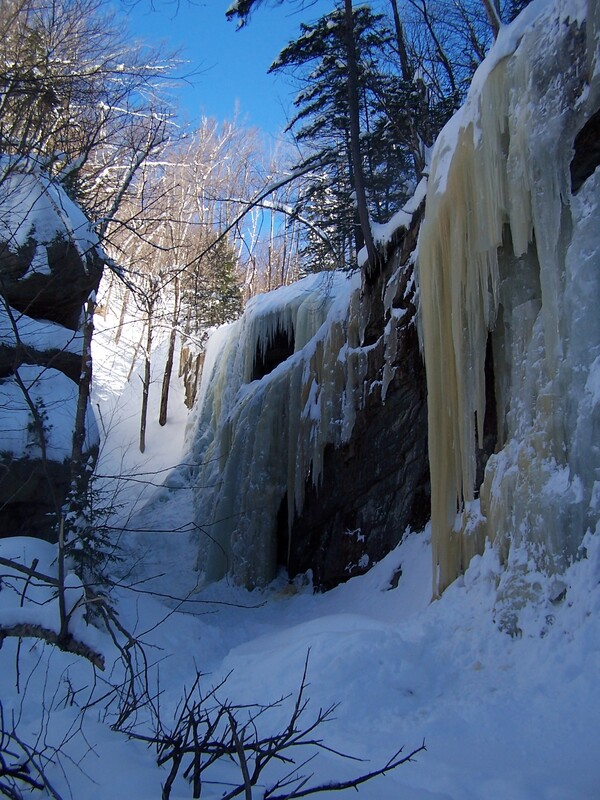 I encountered some icy patches below the falls, but I could have done it without the microspikes. It’s just that you can go faster when you don’t have to watch where you put each foot. 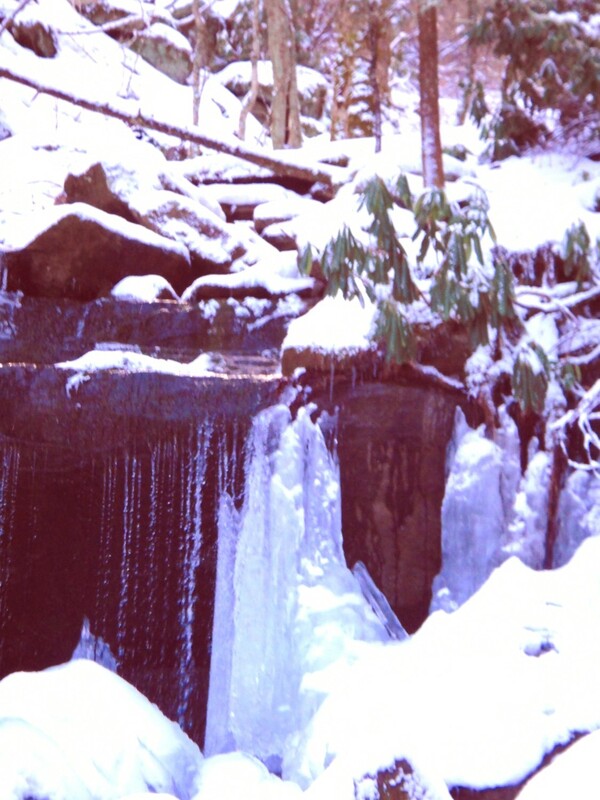 Just below the falls, at around 4000′, the trail started to be snow-covered. A thin layer, well packed down, and undoubtedly gone by the end of the day. I passed the tributary of LeConte Creek that I and two others descended last May on a traverse of Balsam Point. I arrived at the falls. 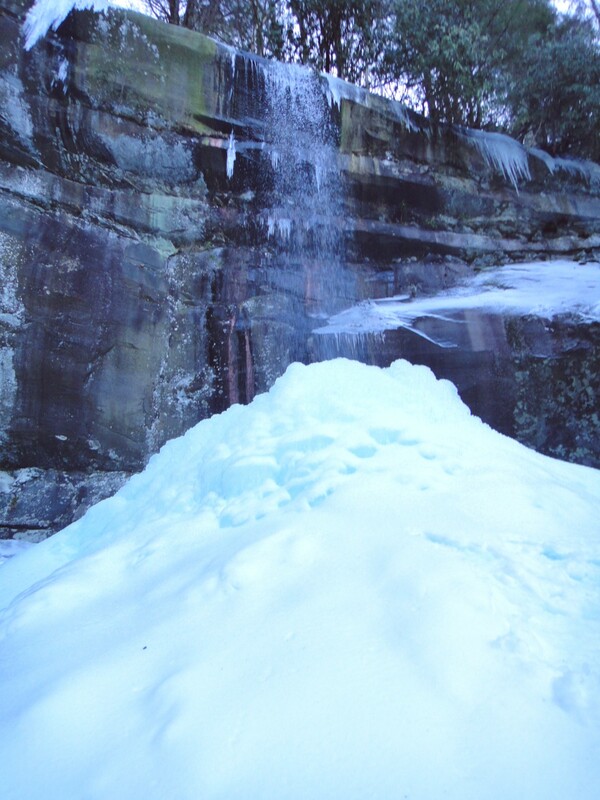 The ice cone was distinctly eerie in its radiant blueness, almost as if it belonged to a different dimension and had been superimposed in front of the falls by some science fiction process. It was the same kind of blue that you see sometimes in glaciers. I read somewhere that the blue color has to do with the absorption and reflection of different areas of the spectrum by ice crystals. There were some good icicles over to the side. 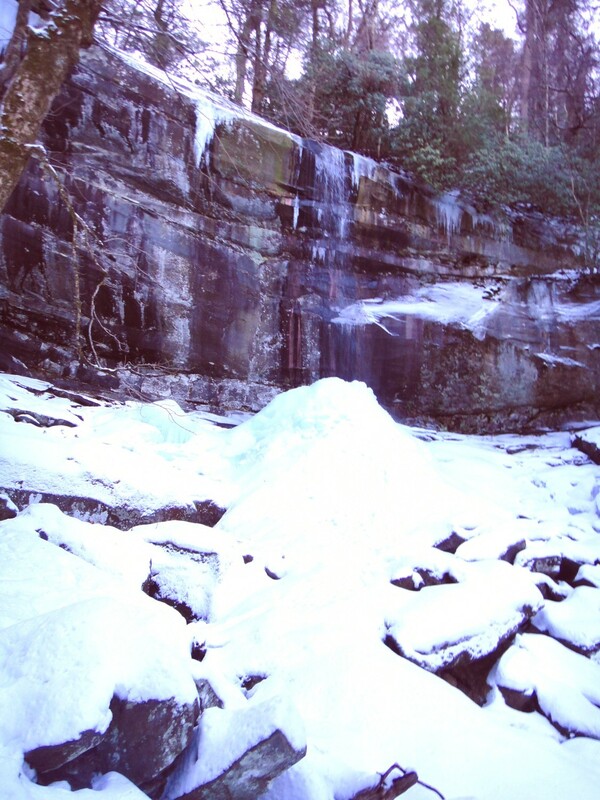 Above the falls, the snow grew steadily deeper, and of course the amount of previous foot traffic dropped off. It looked as though a sort of trough had been created following earlier snow events, and that perhaps one or two people had been up the trail since the most recent snow, plus one set of prints that morning from sports coupe guy. My pace slowed, and slowed, as I worked through the snow. It was a grunt. 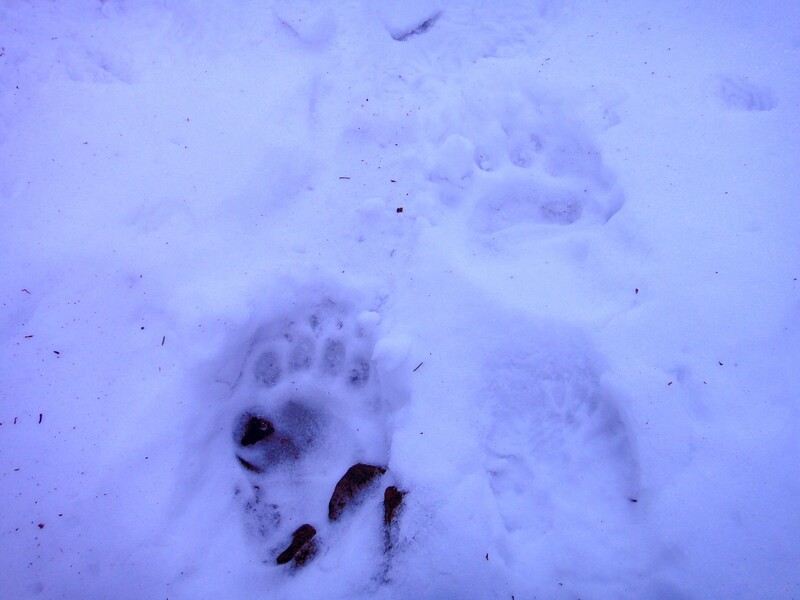 Not far above the falls I saw a nice crisp set of bear prints mixed in with the hiker prints. The snow banks on the side got higher. I stopped for a Power Bar, then ploughed onward. The snow wasn’t horribly deep, but it wasn’t consolidated. Take a step—sink down maybe four inches—take another step. In New England I would have used snowshoes, but they would have been useless here where a narrow track with high walls had been established. The snowshoes are too wide for this situation. Finally I reached the Bullhead junction and discovered, much to my surprise, that Bullhead had been packed down into a tidy sidewalk. I’d been sure the Rainbow Falls trail would have seen more traffic, but that wasn’t the case. Perhaps a large group had climbed Bullhead the day before. (That’s what’s great about snow—all kinds of puzzles written into its surface.) I pressed on to the Lodge, enjoying the firmer surface. It was noon. I found a sunny spot and had some hot tea and something to eat, wondering what had become of all of the Alum Cave trail people. It felt fairly wintry up there. The strong wind out of the south that could have been described as a “zephyr” in the lower sections had become not so pleasant. Because of the wind and also because my legs felt like toast at that point, I decided not to do the short climb up to Cliff Top. The way down was exponentially easier. I looked for the spots where our group had entered and exited the trail on the Balsam Point traverse. After passing the shady sidehill section that crosses the headwaters of Big Branch, I emerged in the lower pine forest that gets strong afternoon sun. There was practically no snow on this section. The galax was gleaming in the sun. 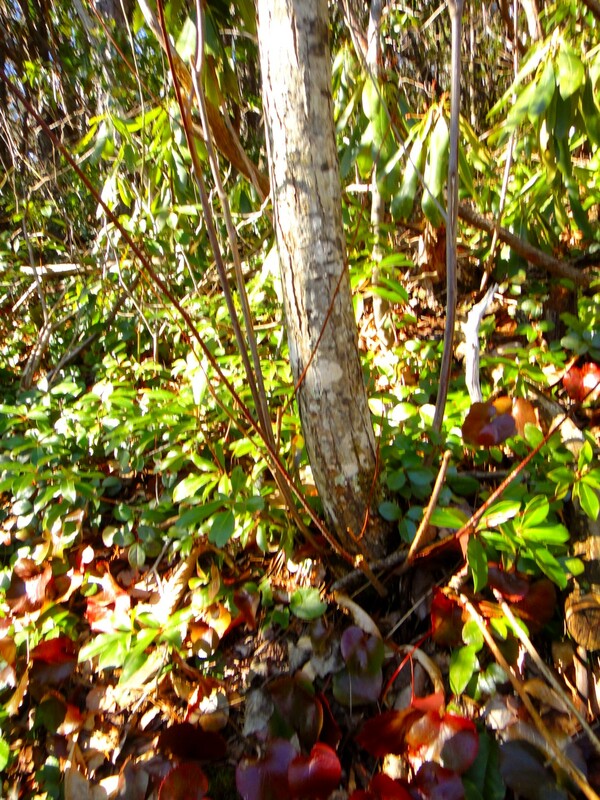 I noticed some chestnut sprouts at 3700′. 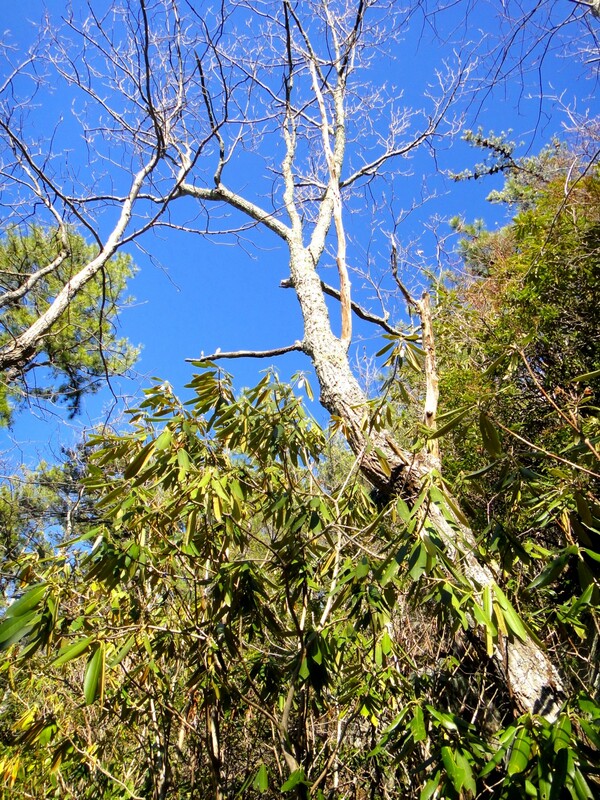 Further down, at 3200′, I saw a 20-foot chestnut that had dropped some burrs into the trail. Unfortunately you could see from some branches that had lost their bark that the tree was dying. 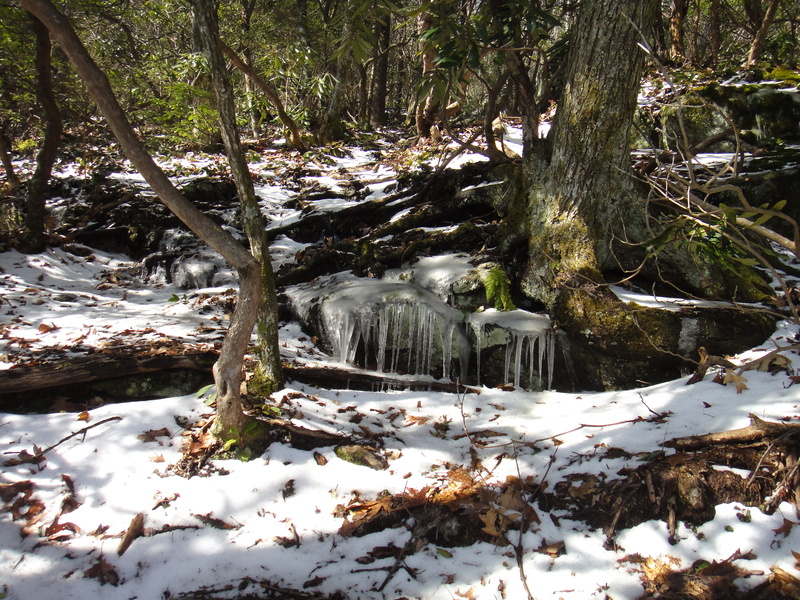 Where the trail turned sharply to the east, I entered a zone of shade once again and found that the trail was quite icy. It was only in this section that I would say some sort of traction device would be nearly mandatory. So I put the spikes back on and wended my way down the switchbacks among giant boulders. Some big ice chunks had fallen into the trail off some of the boulders—ones that could kill you if you were in the wrong place at the wrong time. And so, emerging into the sudden congestion of mid-afternoon traffic at the trailhead, my adventure had ended, and a fine one it was.